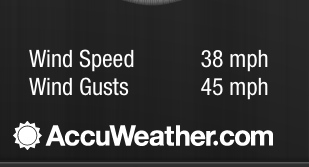 The wind today was crazy! I honestly felt like I was going to blow over a couple of times while out and about. It's basically just rain on top of slush on top of ice. 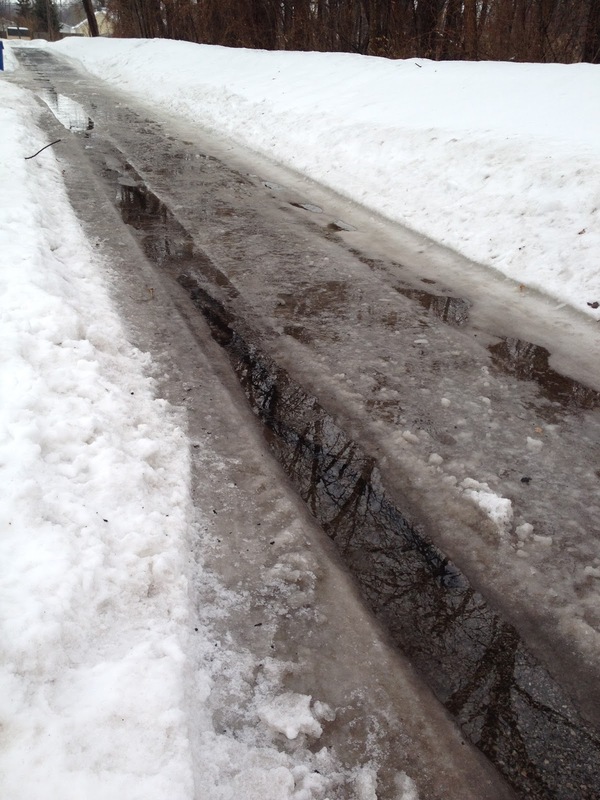 I love that the snow is melting, but it's going to be a big old mess for a while. Needless to say, I chose to do the treadmill for my long run today. I got on the treadmill as soon as I woke up, so I could get the run out of the way before breakfast. While I ran, I watched a couple of episodes of Private Practice (I never watched this show when it was on the air; I'm not a big Grey's Anatomy fan, so I didn't think I'd like it, but I like it much better than Grey's!). I set the treadmill at a 6.0 mph for the first 7 miles, and then I increased it every quarter mile for the last 2 miles, just to get it done. 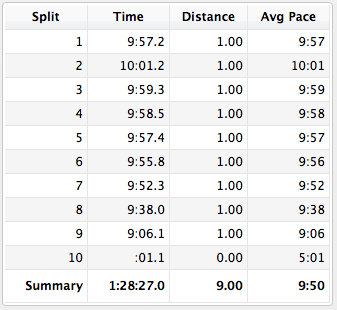 My heart rate stayed at the very bottom of Zone 3 for the majority of the run, and I felt great the whole time. The miles actually went by pretty quickly today! I always love how good I feel after my long run each week. After my run, and breakfast (cheese grits with a poached egg), I asked the kids if they wanted to go see a movie today. Eli was invited to a birthday party at Splash Universe, a small indoor water park about 40 minutes away, and I had planned on taking him; but when I checked out the prices of admission (for Noah and I), there was no way I wanted to pay that much. It's $32 per person to get in! Eli's admission would have been covered by the birthday party, but parents' admission was not. I didn't feel comfortable just dropping him off for the party, especially considering I don't know the parents of the birthday boy. Since I had to bring Noah with me, it would have cost $64 for me to chaperone Eli at a two-hour birthday party. I felt bad telling him no, but he was really excited to go to the movies, so it worked out well. We went to see The Lego Movie (the things you do for your kids!! ha) which was just about as good as I expected it to be ;) The kids liked it though, so that's all that matters. After debating with myself the other day, I've gone back to counting points. Usually, on my long run day, I like to use my activity points on some sort of treat--almost always on dessert. Today, however, I decided to use them on dinner. I've always loved Reuben sandwiches, and this time of year, corned beef is always on sale. So I bought a corned beef and the ingredients for Reubens--pumpernickel bread, sauerkraut, swiss cheese, and Thousand Island dressing. I know they're traditionally made with rye bread, but when I was a kid, my friend Shannon's dad made the BEST Reubens on pumpernickel, so that's how I make them. I put the corned beef in the slow cooker, which made the whole thing so easy (and my house smelled so good while it was cooking!). The sandwich ended up being 16 PointsPlus, which is quite a bit more than I would normally spend on dinner, but it was the perfect non-dessert treat for a long run day! Katie, check out the show 'continuum' on syfy. It's on netflix. I liked Private Practice at first but in later seasons it began to get boring and kind of ridiculous. 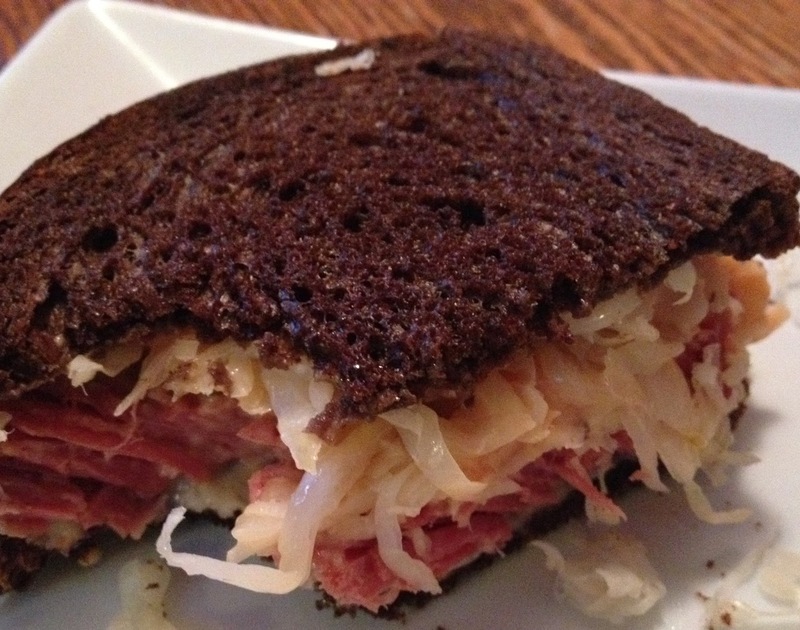 Oh my gosh, I love Reubens and that looks fantastic. Makes me really want one now! I hear ya on the slush. Now that it's warming up it's a big mess. By the way I am in upstate NY and your weather seems identical to the weather here. Every time you post about the weather I am amazed that it's the same here. Weird, right? Reuben Sandwiches--YUM! Just last weekend here in Lincoln, someone held a kid's birthday party at a local motel pool, and one of the parents noticed a child at the bottom of the pool. They got her out and another parents was an EMT, so they revived her and she's fine, but I wouldn't trust leaving my kid off at a birthday party unchaperoned either. That is just scary. Hahaha, I kept waiting for you to introduce someone named Reuben that is on your ragnar team. Not until I was all done reading did I realize reuben was a sandwich. I never really ate Reubens until I met my husband. I'm in MN, so it's coming your way... It's ging to be crappy for a while. Sorry!. Go see the Lego Movie. We dn't have kids, but my brother loved Legos growing up. I thought the movie looked good. So we went. LOVED IT! Everything is awesome! I have never had a Reuben sandwich, however it looks delish! Im going to try this on pumpernickel and rye to see which I like better. Even though this is an old post, I thought I would mention this corned beef recipe that I think you might like. It is on the sweeter side, which I know is often your preference. You could probably cook it in the croc pot instead of boiling it on the stove, but once you put the glaze on, I would recommend giving it some time in the oven so that the sauce can caramelize. Maybe not the best as a Reuben, but delicious on its own!